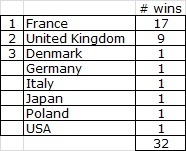 On this page several European Grand Prix related statistics are listed that have to do with winning the European Grand Prix or a stage of the European Grand Prix. Winning a stage of the European Grand Prix is worthy achievement. No less than 55 players managed to do this. They originate from 15 different countries and 3 continents. Winning the European Grand Prix series is a result of playing well all season long. 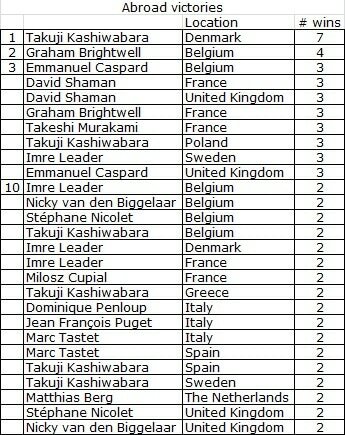 13 players have maintained their focus throughout the season and are listed as winner of 'the' European Grand Prix. These players originate from 8 different countries. There are 32 victories listed over 31 seasons as there was a tie in the 1989 season. 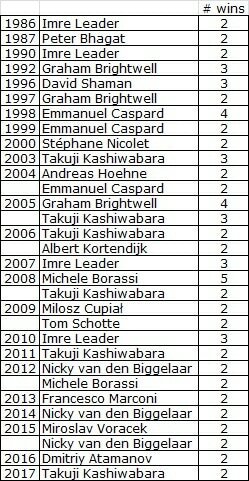 In 2016 Takuji Kashiwabara conquered a historical 10th European title. There are 16 players who managed to win more than one stage in one season. 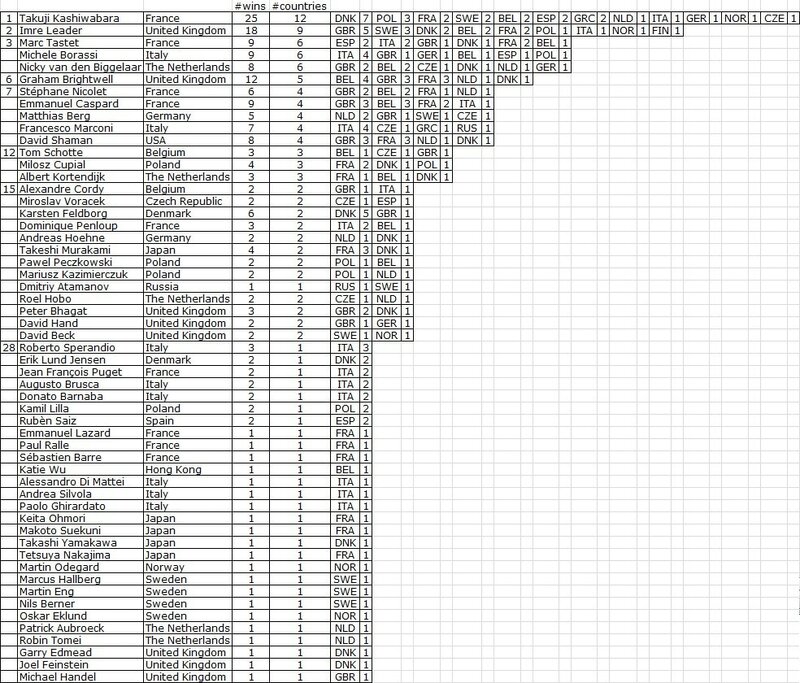 Winning multiple EGP stages in one season is mostly leading a player to the European title. There are six occasions were this was not the case. In all other years a player with the most stage wins has won the title. In five of these Takuji Kashiwabara was involved. Graham Brightwell won 2 stages in the 1997 season, but it was Marc Tastet who claimed the title. Nicky van den Biggelaar and Michele Borassi won 2 stages in the 2012 season, but it was Takuji Kashiwabara who claimed the title. Francesco Marconi won 2 stages in the 2013 season, but it was Takuji Kashiwabara who claimed the title. Nicky van den Biggelaar won 2 stages in the 2014 season, but it was Takuji Kashiwabara who claimed the title. Nicky van den Biggelaar and Miroslav Voracek won 2 stages in the 2015 season, but it was Takuji Kashiwabara who claimed the title. Dmitriy Atamanov has won 2 stages in the 2016, but Takuji Kashiwabara claimed another title. 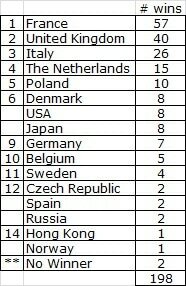 There are at the moment 14 organising countries. 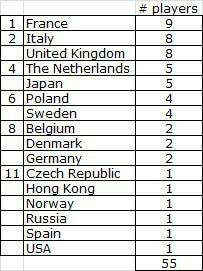 25 players managed to win in more than one country. 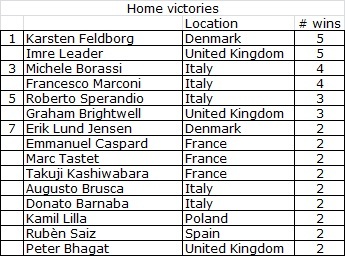 Takuji Kashiwabara added victories in Norway and Greece in 2015 and now has won tournaments in 12 countries. He missed Cambridge 2016 by one disk and missed Saint Petersburg 2016, so he will have to wait another two years before completing his flag collection. 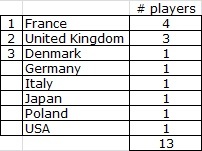 There are 23 players who managed to win more than once in a particular country. 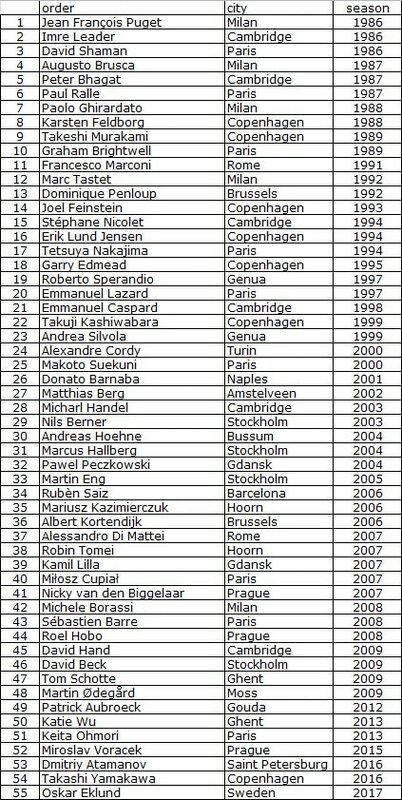 The list below shows the order in which players have won their first European Grand Prix tournament and entered as such in the hall of fame.